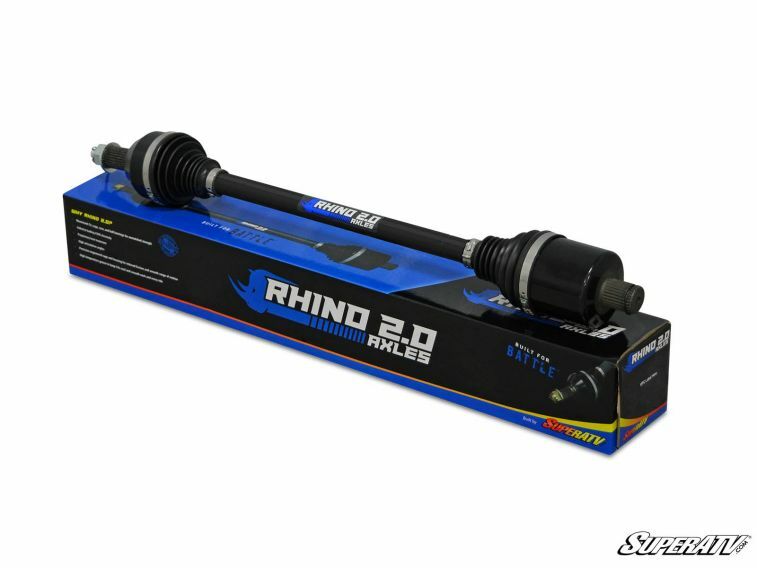 With Rhino 2.0 Axles installed on your Polaris RZR XP Turbo S, you can ride longer, ride harder, and ride better. 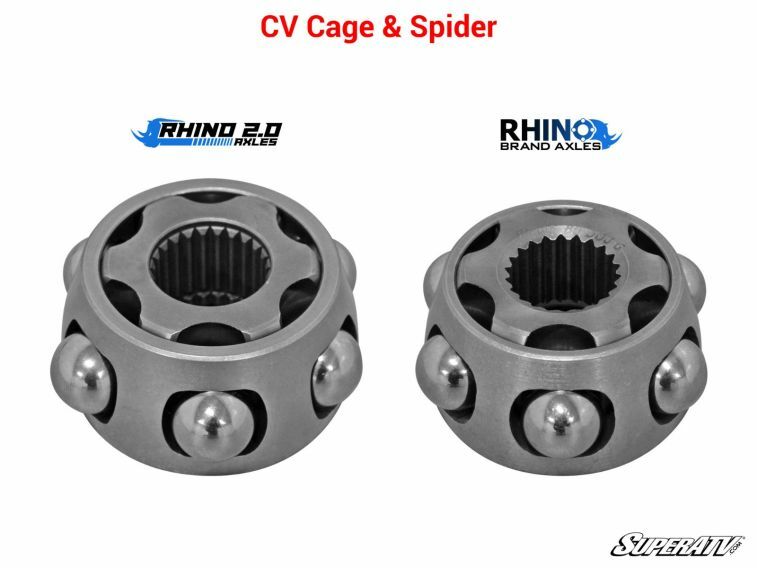 SuperATV’s Rhino 2.0 Axles combine maximized shafts and CVs with heavy-duty 4340 steel that’s heat treated for superior strength and longevity. 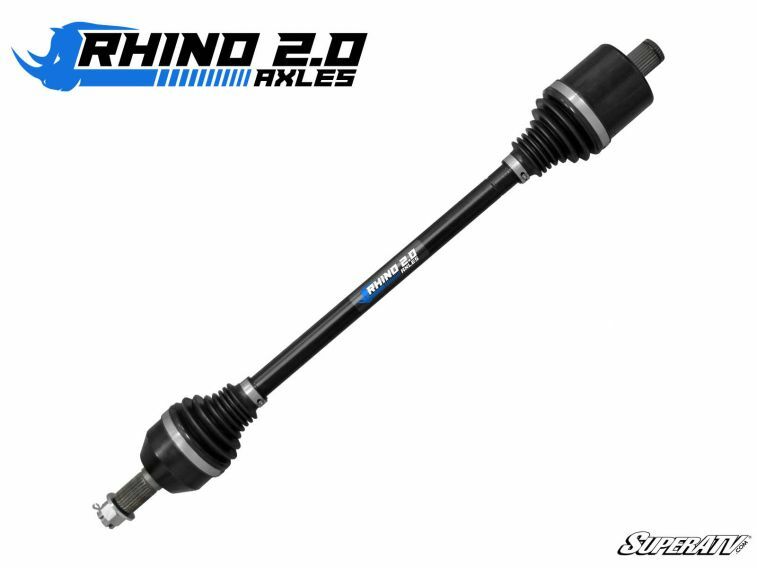 The result is a heavy-duty axle that can handle 40°+ axles angles without binding or overheating and can handle massive torque without breaking. That means you can ride with a lead foot and a smile on your face. Rhino 2.0 is built for that. We set out to build the best axle we could, and the only way to know if it's the best is to test it. That's why we invested millions in cutting edge strength and fatigue testing technology to ensure we had the best heavy duty axle on the market. 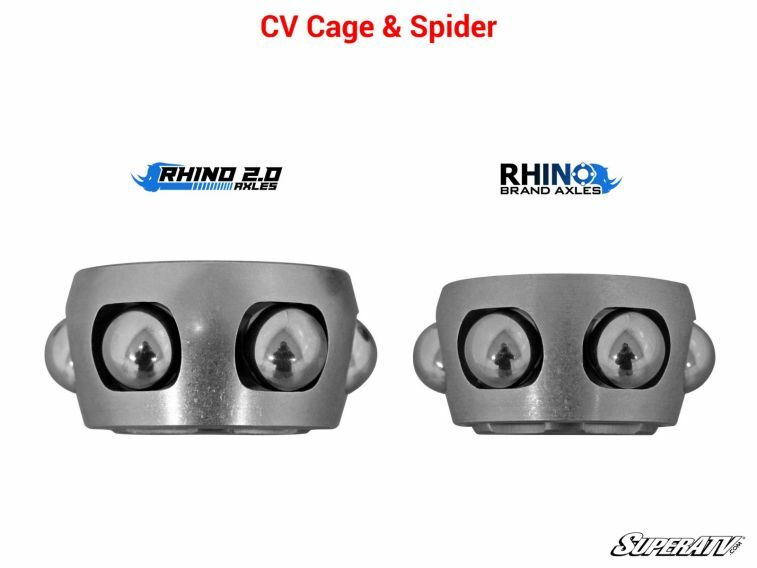 We are the designers and manufacturers of Rhino 2.0. With years of axle making experience under our belts we had complete control over every aspect of this axle and it shows. It beats out every axle in its category for strength and longevity because it's built smarter and built better. That's what SuperATV engineering achieves. 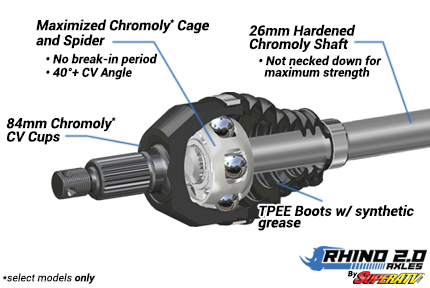 Rhino 2.0 Axles are backed by an industry leading 18-month warranty. It’s got the UTV industry’s best warranty and the best bang for you buck. 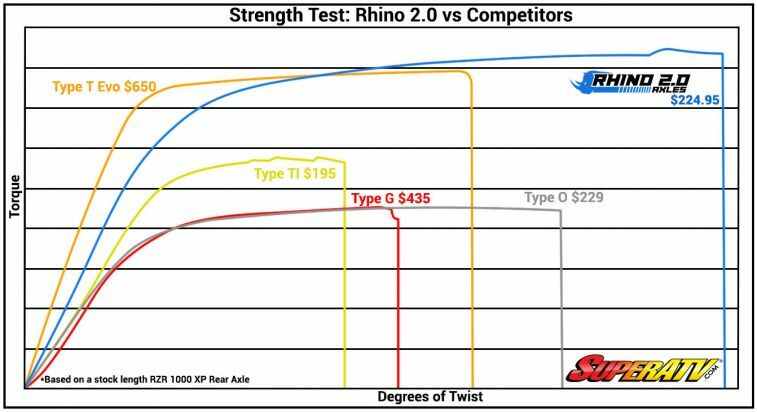 Test after test proves that Rhino 2.0 outperforms axles in the $550-$900 price range even though it’s only a fraction of the price. Get Rhino 2.0 and experience the Rhino Revolution — we’ve got your back. A massive 4mm increase in shaft size! 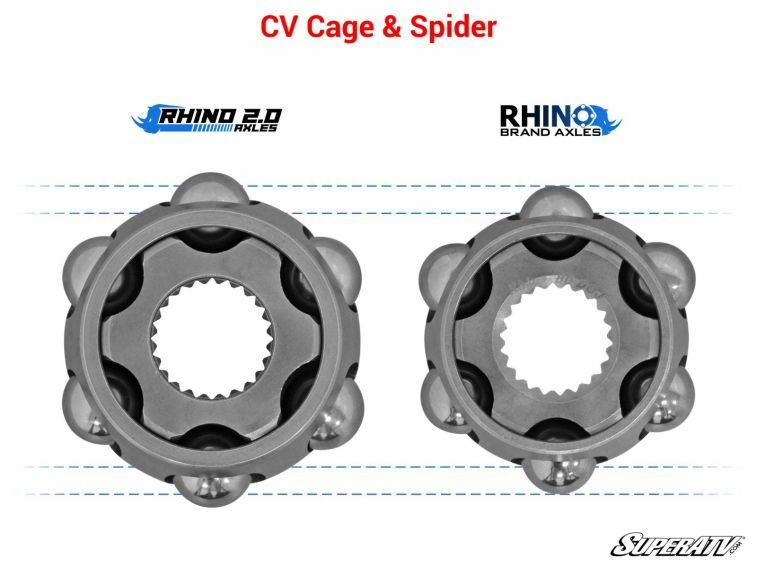 SuperATV Rhino 2.0 Axles (excluding boots) are warrantied to the original purchaser for a period of 18 months from the date of purchase. If the axle fails for any reason within 60 days from the date of purchase, SuperATV will ship a replacement axle free of charge. If the axle fails after 60 days, but within the first 18 months of the date of purchase, the purchaser must pay a flat $50.00 replacement fee. In all warranty cases, the purchaser must provide SuperATV with proof of purchase and proof of breakage.